Which book truly inspired you? Reflecting on the books I‘ve read over the years, I find this question almost impossible to answer with one title. At different times in my life, different titles have engendered different feelings, shifted my focus, awoken in me a desire to emulate my heroines and their lives; be more adventurous, kinder, to dance, to ride, to seek knowledge and even to metaphorically, fly. I blame Jo March from Little Women for the fact that I “travelled to the beat of a different drum” most of my life. Although I wanted to be gentle Beth, or sensible motherly Meg, in my heart I knew I was a Jo. A series of books by English author Judith M. Berrisford about a magnificent white Arab horse, Ballita, inspired me to ride and although I never went to pony club, I nevertheless spent many a happy hour on horseback. My own magnificent Arab was just a very ordinary bay, but in my mind, our adventures were as amazing as anything Judith wrote. At the same as I was practising for the Grand National (National Velvet was another favourite), I was also in training to take over from Margot Fonteyn (did you guess I’m a Gemini?). Lorna Hill wrote a wonderful series about ballet at Sadler’s Wells which truly inspired me to keep trying when my turnout wouldn’t turn. Uncle Tom’s Cabin by Harriet Beecher Stowe and My Life with Martin Luther King Jr by Coretta Scott King brought my inner crusader to the fore. White Coolies by Betty Jeffery inspired a lifelong interest in women’s war experiences. I could continue, of course, and tell you how Jane Austen, Charles Dickens, Edna O’Brien, James A Mitchener, Harper Lee, Leon Uris, Ruth Park, etc etc all awoke, or reinforced, something inside me. It is said people come into your life for a reason, a season, or a lifetime and I believe for readers, this also applies to books. Often, I find the right book at the right time, one that answers the questions I don’t necessarily know I’m asking. So, you ask, what is my most inspirational book? 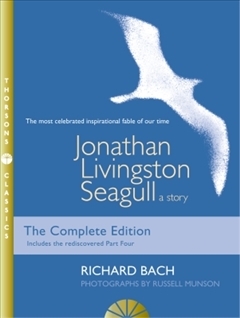 Jonathan Livingston Seagull, by Richard Bach. This simple slim book, a modern parable, went straight to my soul and answered many unasked questions. It reminded me I can soar, that the beat of my drum is uniquely mine and the only thing limiting me is my lack of belief in myself. Now over to you, what book most inspired you and why?